Why you want to over treat alfalfa. The one crop that is probably the most difficult to establish a good stand and maintain that good stand for 3-5 years is alfalfa. There are many factors that may contribute to good stand establishment such as seed bed preparation, good seed to soil contact at planting, fertility, weed control, insect control, etc. Probably the most overlooked contribution to good stand establishment is the success of good nodulation on the alfalfa plant. When farmers are planting alfalfa they often neglect to consider what they need to do to assist the alfalfa in establishing good nodulation. The nodulation process is key in assisting the plant to develop nodules that will help convert atmospheric nitrogen to a form of nitrogen that is usable by the alfalfa plant. Since Alfalfa is a legume crop, this process is similar to the nodulation needed for healthy growth of the soybean plant. However, the Rhizobia found in the soils for soybeans are not the same Rhizobia that are needed for alfalfa. The soybean requires the species Brady rhizobium japonicum while the alfalfa plant requires Sinorhizobium meliloti. Therefore, it is economically important that alfalfa seed be inoculated prior to planting to assist the plant in establishing beneficial nodules. 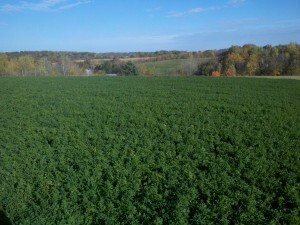 Considerations need to be made by the farmer to determine how their alfalfa is inoculated. First, we must consider where alfalfa seed is produced: in the western arid states. There it is harvested, graded, treated with insecticide/fungicide, and sometimes inoculated before going into the bag. Second, when the seed is shipped back to the eastern states it is often during the hotter months of the year, July or August. Lastly, take into consideration that inoculants are living biologicals that do not survive well when temperatures rise above 80° F. Let’s think about this; this is pre-inoculated seed that was loaded into semi-trucks and shipped across the mid-west for 2-3 days in July and August in a hot truck before it reaches its destination in a seed warehouse. Once in the warehouse the pre inoculated alfalfa seed must then be stored properly to maintain inoculant viability. Whether or not it is stored at the correct temperature is up to the individual warehouse. Regardless, the inoculant is most likely already degraded by the time it reaches the warehouse. 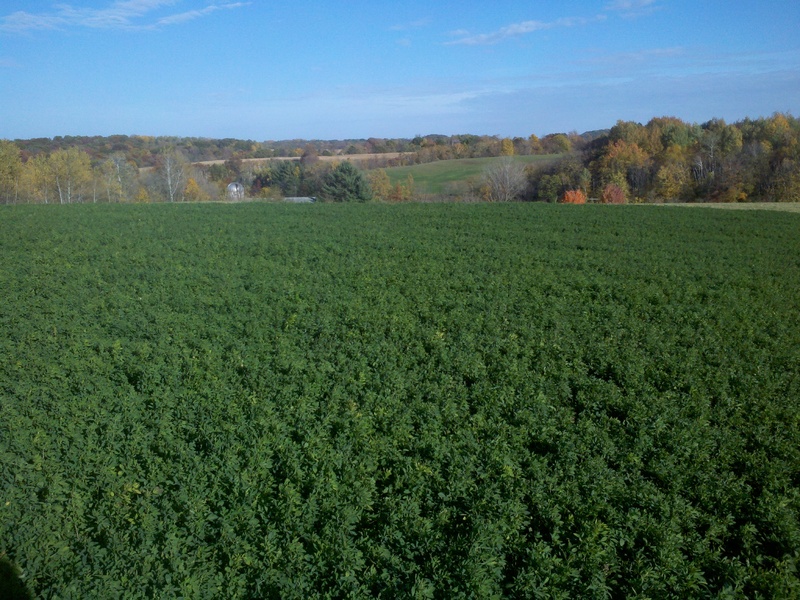 In 2012 ABM conducted a research trial in Wisconsin to determine the effectiveness of pre-inoculated alfalfa seed versus the same alfalfa seed “over treated” with Graph-Ex SA™ for Alfalfa just prior to planting. It was determined that one year old pre inoculated alfalfa seed yielded 3% less on the first cutting and 5% less on the second cutting when compared to the same inoculated seed “over treated” with fresh Graph-Ex SA™ for Alfalfa. 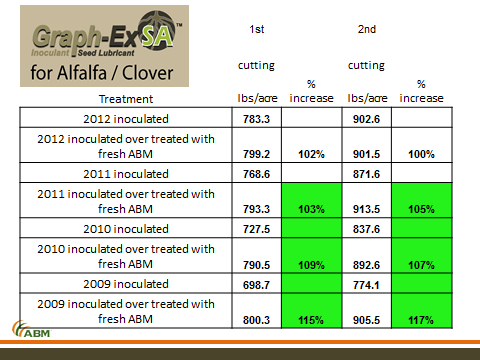 Additionally, alfalfa seed that was 4 years old, pre inoculated, yielded 15% less on the first cutting and 17% less on the second cutting when compared to the same inoculated seed “over treated” with fresh Graph-Ex SA™ for Alfalfa. When purchasing Alfalfa seed, you will want to know if it is pre inoculated and where it came from. You will also want to know how long it’s been since the seed was treated with a pre inoculant. Finally, you will want to know if it was stored in cold storage during the hot summer months. Based on this information you will want to consider treating your alfalfa seed with Graph-Ex SA™ for Alfalfa at planting. Graph-Ex SA™ for Alfalfa/Clover contains a specially formulated blend of Excalibre® Alfalfa/Clover Inoculant plus SabrEx™ Root Inoculant formulated in a talc-graphite carrier. To learn more about Graph-Ex SA™ for Alfalfa, contact your local ABM representative by clicking here.